Evgeny Bareev, in what’s rapidly becoming a tradition, was again talking to Yury Vasiliev of Sport Express. And again there wasn’t a bland answer in sight, though you do wonder if the public identification of the “weak link” in the Russian women’s first team isn’t taking glasnost a step too far! His opponent, frankly, played very timidly. 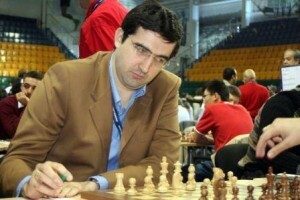 I think the height, weight and image of Kramnik was a burden he couldn’t deal with. At first he wanted to play something aggressive, but when that didn’t work his mood soured and he couldn’t put up any resistance. 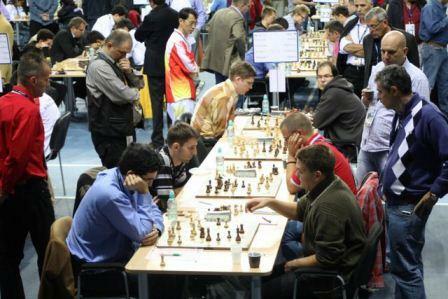 Vladimir played the game calmly and evenly, precisely taking advantage of the insipid play of his opponent. He didn’t need to do anything brilliant – accuracy and class were enough. 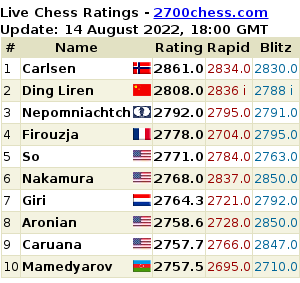 While Grischuk, on the other hand, had to demonstrate remarkable ingenuity in order to win. Alexander played a new opening for himself – the French Defence, which he’d prepared especially for the Olympiad. The opening’s aggressive and it was a case of sink or swim. 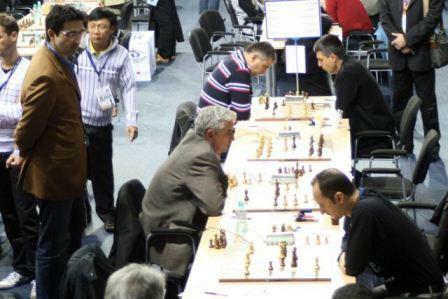 At a certain point it looked as though the fate of the game was hanging by a thread: Vuckovic seemed to make a healthy piece sacrifice, and Grischuk only had one possible defence, which his opponent, clearly, underestimated: the position was still unclear, but the Serb didn’t play as strongly as he could and as a result had to accept defeat. Peter Svidler played a far from ideal Sicilian – this time as white – and, having ended up “worse”, asked for permission to offer a draw. Of course, I allowed it. If the opponent was a little bolder he could have kept playing and, more likely than not, he’d have beaten Peter. 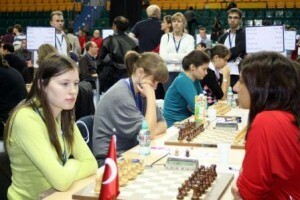 On the fourth board we were “worse” out of the opening, but the difference was that the Serb Markus didn’t want a draw. And in the end Malakhov managed to save the game – at the cost of a heroic defence. The match was even and we didn’t expect an easy win. It strikes me that it wasn’t even a bad thing that as early as the second round the team realises that it’s going to get tougher and they need to show their best qualities. You can’t count on someone next to you, everyone has to give their all. Weren’t strong is putting it mildly. And there were absolutely no problems during the match. And what can you say about our women’s teams? And Mikhail Gurevich. The match turned out even and everything was decided in the final game, where an endgame arose. Of course, for almost all the women that’s a weak point. And if it comes to an endgame the trainers need Validol. But in the end it worked out ok: we won the match. Our main women’s team met the Bosnian players. Nice girls, but weak. Right from the opening Kosteniuk and Tatiana Kosintseva were heading for victory, while Galliamova had a large edge with black. I can confidently say that she’s the weak link in our team: she’s finding playing very tough, making mistakes, blundering… Alisa is burdened by a family, children and she asked to be let out of the training camp early – in general, it’s clear that in the decisive matches our women will have to play without her. Perhaps Galliamova will still find her form, she’s got colossal willpower and experience, but it’s clear that she hasn’t approached this event as the most important one in her live. While that’s exactly what I was trying to get across to all the players in our teams. And I have to say that the overwhelming majority of players have approached their training with exceptional responsibility. Vladimir Barsky again produced a colourful photo report for the Russian Chess Federation website, from where I’ve taken the photos used here. Perhaps the most memorable is the one below of Kramnik inching towards Topalov’s board. Such a relief that US-style political correctness has not yet taken over the globe, so that we can enjoy frank and embarrassing interviews such as this! As for the last photo, Big Vlad should have gone right up to the board and gloated.